Welcome to the first Fiction Notes Podcast, where you’ll learn six ways to use the Shrunken Manuscript. I teach a novel revision retreat; in order to attend, you must have a complete draft of a novel and we spend the weekend talking about how to revise that manuscript. 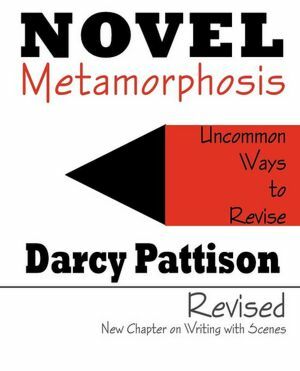 The workbook for that is Novel Metamorphosis: Uncommon Ways to Revise. Traditionally, we only go into depth on the Shrunken Manuscript technique in the retreat, but for the first time publicly, I’m going to explain six ways to use the Shrunken Manuscript. It’s a fitting topic for Fiction Notes’ first Podcast. Need more information on revising a manuscript? Click here for information on hosting Darcy Pattison’s Novel Revision Retreat in your area. The workbook for the retreat is Novel Metamorphosis: Uncommon Ways to Revise. Order now. Learn many other uncommon ways to revise your novel and break through to publication, or break out your novel to stronger sales. You can listen to it by simply clicking on the arrow on the Podcast PlayLink. You can also download the podcast and play it on your iPod, iPhone, etc. You can embed the podcast onto other websites. If you do this, please let me know! (darcy at darcypattison dot come). The podcast will soon be syndicated on iTunes and when it is syndicated, you can use a variety of apps to download and listen to it from a variety of platforms, such as iPod, iPhone, iPad, Android, etc. Thanks for this podcast, Darcy. I’ve got it in my favorites now for easy referral. This is helpful even before the first draft is finished. Thanks! Yes, it is helpful even when drafting, partly because it forces you to think about what your ideal novel would be. The podcast message provides us visual ways to revise, revise, revise! Thank you! Thank you for sharing this great podcast, Darcy. I’m one of the visual learners you mentioned. Although it seems simple when I hear you say it, I had yet to find a way to ‘mark’ my manuscripts for visual impact while editing. This is simply brilliant! Thank you again. Thanks, I hope it helps you revise and write that book of your dreams! Darcy, thank you for sharing this method and how it can help revision. I know I will be listening to it more than once. Say, is there any chance that you might put Novel Matamorphosis on ebook at some time? By the way, I really enjoyed the podcast! It is always possible. What format?